So basically, here, I will be posting a card with a ruling, and how to interpret it. I am tired of seeing people say Mystical Space Typhoon negates. soooo yea. So let's talk. Does anywhere in the text provided does it say negate. Also notice how it's quick-play, meaning you can play it during your opponent's turn to get rid of those pesky traps they begin setting. However, it does not negate. 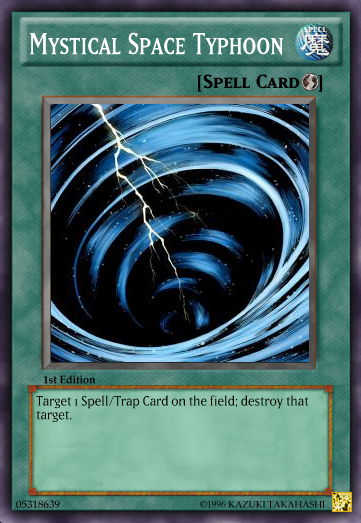 The only spells and traps this card can "negate" are field spell's and continuous traps. Since these cards must remain face-up on the field in order to resolve and get their effect, they don't activate. Mystical Space Typhoon isn't that great of a card, but I recommend 2 or 1 depending on what your deck is. LORE: Pay 1000 points. The effects of all face-up effect monsters are negated. Oh boy, we got ourselves a card. This card will be used mostly in decks that benefit from it, dubbed Skill Drain Decks. These decks contain powerful monsters that can easily get themselves out, but without the negative effect. This card will cause many confusions, but no need to fear! I am here! 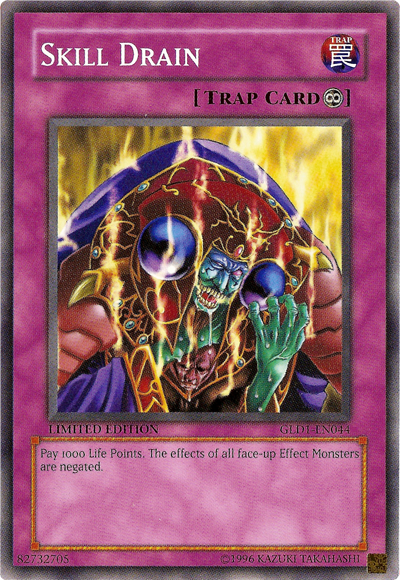 Basically, this card only negates monsters effects that resolves on the field after activation. Meaning cards like Black Rose Dragon that destroy the field including itself, will be negated since it still is on the field at resolution of the effect activating. Then there's cards like Rescue Rabbit. Rescue Rabbit's effect allows it to banish itself from the field to special summon 2 normal monsters. Since it resolves in the banished or RFP area, it's effect can't be negated. The important thing to know about Skill Drain, is that it can't negate costs. So if the cost is to flip itself face-down, or off the field, it can't negate that, and the effect will resolve thoroughly. That is why Cyber Ourobouros's battle phase ender will work. Say your opponent would activate a continuous or field Spell or Trap card that would negate your activating Spell cards. You can chain MST to that card before the activation can resolve and destroy it.